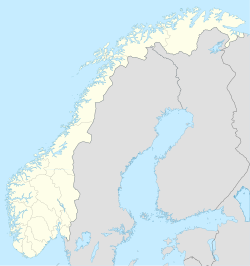 Ersfjordbotn is a village in Tromsø Municipality in Troms county, Norway. The village is located on an isthmus between the Ersfjorden and the Kaldfjorden on the island of Kvaløya. It is about 15 kilometres (9.3 mi) west of the city of Tromsø. The villages of Kjosen and Kvaløysletta are located just to the east of Ersfjordbotn. Ersfjordbotn is slowly moving from a traditional rural settlement to a suburb of Tromsø, and most people work in Tromsø, half an hour's drive away. The 0.31-square-kilometre (77-acre) village has a population (2017) of 499 which gives the village a population density of 1,610 inhabitants per square kilometre (4,200/sq mi). ^ "Ersfjordbotn" (in Norwegian). yr.no. Retrieved 2012-12-14. ^ Store norske leksikon. "Ersfjordbotn" (in Norwegian). Retrieved 2012-12-14. This page was last edited on 14 August 2018, at 02:43 (UTC).